Latent print examiners have the final say on the evaluation of latent print evidence in most cases. If the examiner determines an exclusion, no one will revisit the evidence. Even in jurisdictions with some level of auditing, the vast majority of cases never get a technical review on suitability. Knowing how to search smartly and when to exclude is perhaps one of the most important roles of the latent fingerprint examiner. Examiners must work efficiently and effectively to make sure that all searches yield the highest quality results. While these steps are presented in succession, Gray suggests they need to be handled more like a flow chart. Moving from one step to the next should only happen after an important self-check. As the examiner moves from one step to the next, it is critical that they ask: Have I been focused and on task throughout this step? Yes or no? If there are any doubts or distractions the examiner needs to repeat the previous step. If the answer is yes, he or she is good to proceed. It’s important to realize that you won’t know if you have everything you need until you identify a print. Gray notes. She vividly remembers one homicide case that concluded with taking about 46 pages of standards from an individual because of the location of the print she needed to examine. The examination could not finish without sufficient and complete material to work with. After a thorough examination of the print and the standards, looking for ridge flow, focal points, cores, and deltas, as well as rotating the latent print to look from different points of view, examiners must find a good target for the next step of the analysis. Since a complete print standard from the last portion of a finger can have up to 225 individual characteristics, an accurate exam cannot be done based on the totality. It is simply too much detail to process in the brain. Examiners need to focus on a subset of the entire print, and that’s the role of selecting a target area. “A good target is something your eye hones in on, something that jumps outs when looking at the print,” Gray says. Pick two to five components – dots, bifurcations, ending ridges – in close proximity to create a target area for the examination. The important thing is to narrow to something small that can be searched efficiently. 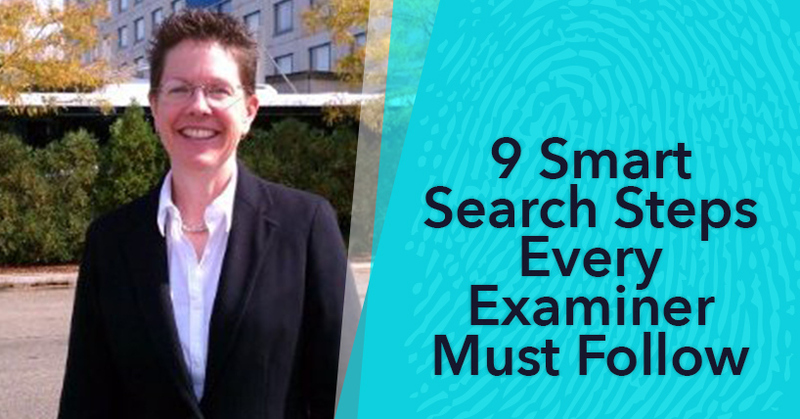 Gray believes that these smaller-scale searches are key to efficiently and effectively serving the case. Compare the latent print target to the standard. If there is any question search again. “A single search through does not usually mean you can eliminate,” Gray says. You may decide you need more complete standards. You may need to revisit one or more steps. But the biggest question involves a careful self-audit. Have I stayed alert and focused through my whole search? Is my head in the game? “The longer you have been doing the job the more you are aware of any distractions. Don’t gloss over them,” Gray says. The best examiners will keep a case open and look again when the distraction, which can be anything from a phone call to a major life event, is eliminated from the process. Only when a systematic, focused exam is completed can you safely make an elimination determination. She recommends that no case be considered complete until the examiner can say with confidence that the work was done with clear standards and that the searches were conducted without distraction. The nine smart search steps need to be coupled with excellent documentation. The examiner’s word on the witness stand is no longer good enough. The proof is in the documentation. Latent examination is nothing without documentation. A computerized system like LatentWorks allows for complete, fine-tuned documentation for an agency. The system makes it easy to document latent print examination work in real time. The documentation is then accessible and transparent to everyone. LatentWorks provides a software platform designed to bring a systematic workflow-based approach to the documentation of the latent examination process. LatentWorks also assures that there is consistency in terminology across all documentation prepared by all the individuals within each latent unit. Learn more about LatentWorks. See other Mideo latent-related blog posts here.